WARM WELCOME The current owners of the Crosby house on Camarillo, Kathleen and Jonas Cedergren, with their two younger children, Trey and Maya. “It’s a great neighborhood,” Kathleen says. “It feels like small-town America. It has the tradition that is disappearing from our culture and the sense of community that’s often missing from big cities.” Photo by Daniel Deitch. 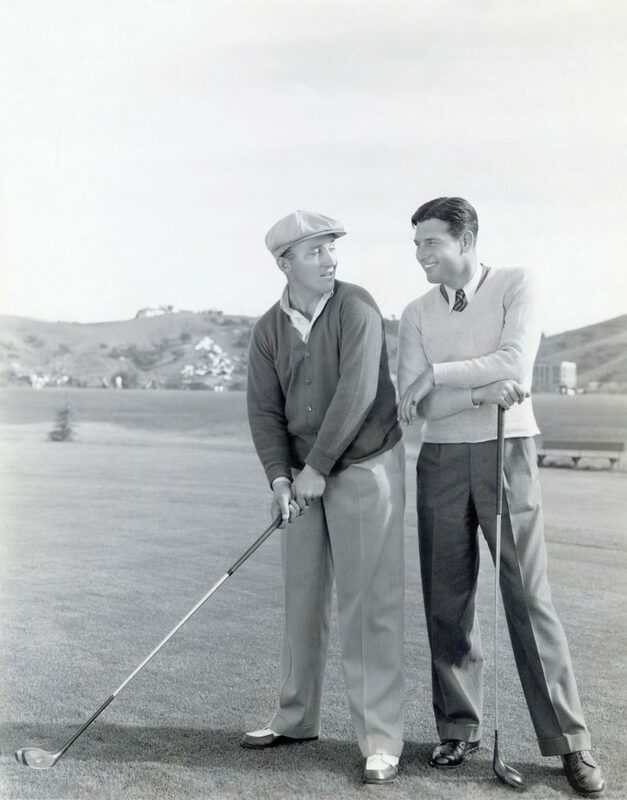 Bing Crosby (left) with fellow Paramount actor, Toluca Lake neighbor and Lakeside Golf Club member Richard Arlen in 1934. The two were good friends; in fact, when the Crosbys were expecting their first child in 1933, Arlen bet Bing $100 that the baby would be a girl and would grow up to marry his son, Richard Jr., who had been born the previous month. Arlen lost the bet, but the two infant boys celebrated their christenings together with a party at the Crosby home on Forman Avenue. Photo from the collection of Mary Mallory. In 1933, Bing Crosby signed a five-film contract with Paramount Pictures and relocated from New York to Hollywood. 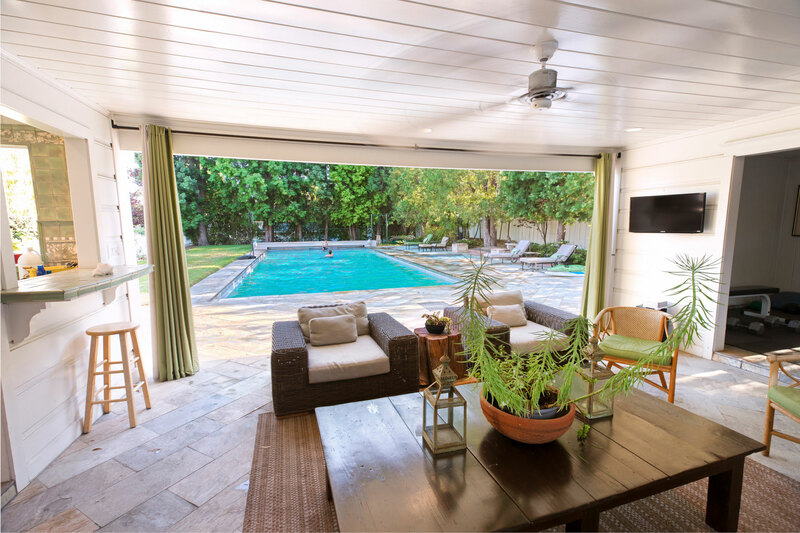 With their first child due in June, he and his wife, Dixie Lee, began building their first home in a peaceful, family-friendly area not far from the studio — Toluca Lake. Although his movie career was just starting, Crosby was already a successful and influential performer, nationally beloved for his spirit-lifting songs during the Great Depression. 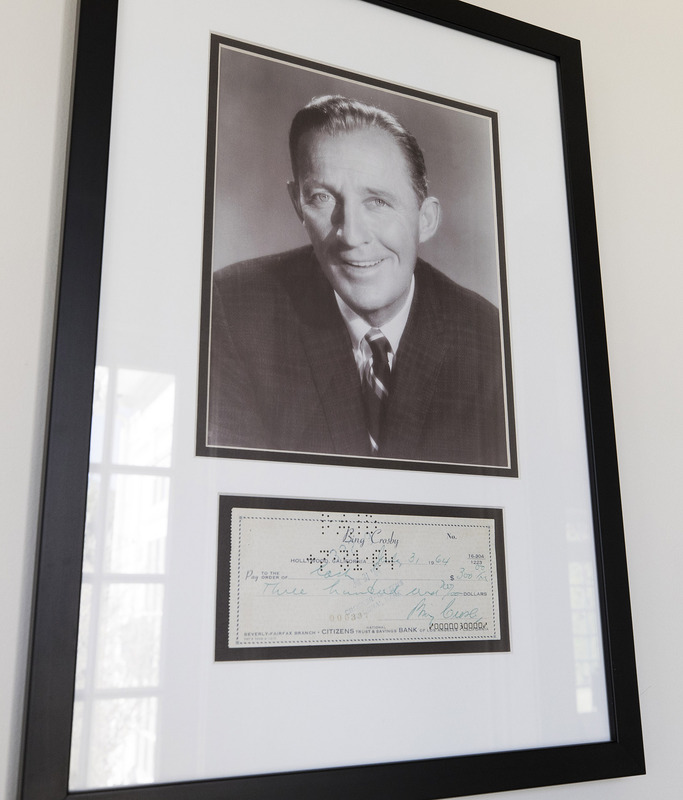 “People forget Bing was reportedly the highest-grossing singer, the most popular and well-recognized, from the early ’30s until Elvis came along in 1956,” says Bob Carter, who currently resides with his wife, Darlene, in the Crosbys’ first Toluca Lake house. Crosby dominated radio, the music industry and the silver screen — he not only made more studio recordings than any other singer, but he also charted the most No. 1 hits (38) and the most popular record ever (“White Christmas”), and he appeared in 104 films. “And of course, let’s not forget that he won multiple club championships at Lakeside Golf Club,” Carter adds. Crosby brought his major star power to Toluca Lake for a decade, and his legacy as one of its most prominent residents continues today. By 1936, the Crosbys had three sons and wanted a larger place for their growing family (a fourth boy would come along in 1938), so they sold the Forman home to two other famous entertainers, Al Jolson and Ruby Keeler. (Carter recalls that Keeler’s niece, who was born in the house, stopped by to see it a few years ago and reminisced about spraining her ankle on the stairs “sometime in the late ’30s.”) After that, the house didn’t make headlines again until Getty Oil executive Sid Petersen bought it in 1976, living there with his family until 1992. HAPPY HOME Bob and Darlene Carter have lived in the Crosby house on Forman since 2012. 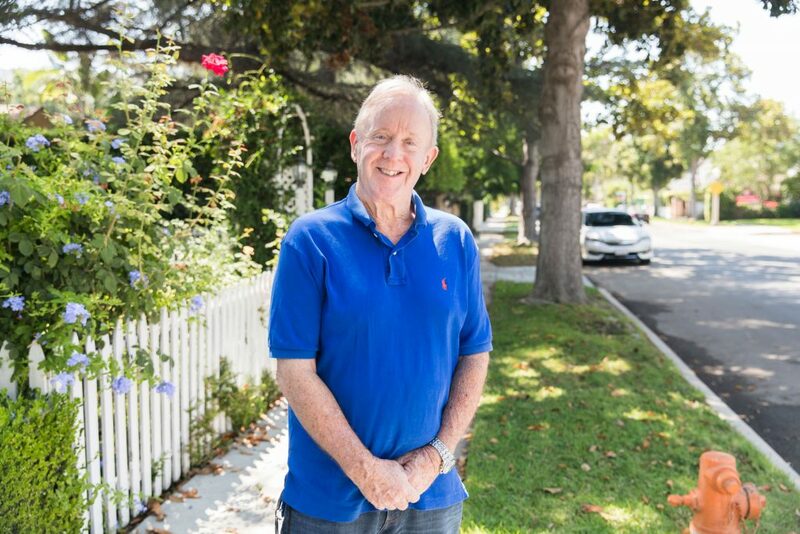 “Toluca Lake just has a natural, unique charm, the nuances of the American dream,” Bob says. Photo by Daniel Deitch. 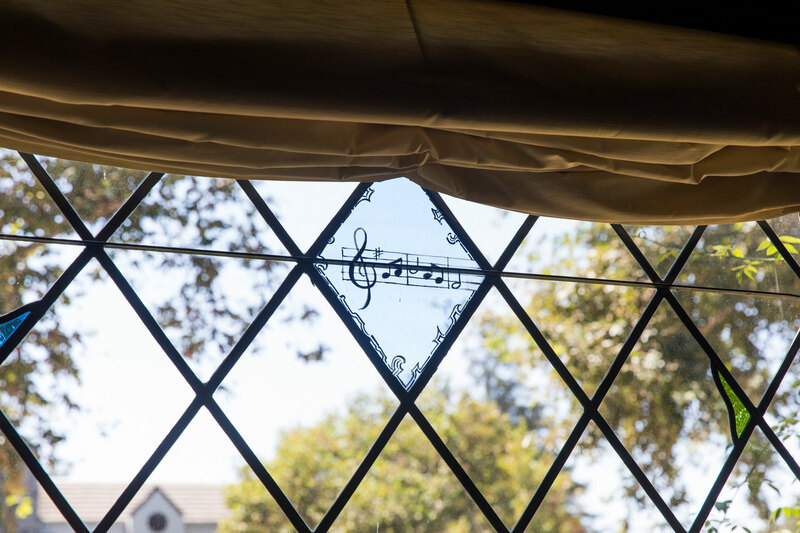 Dixie Crosby’s father included this tribute in the front window: stained glass depicting the first six notes of Bing’s then-famous radio theme song, “Where the Blue of the Night Meets the Gold of the Day.” Photo by Daniel Deitch. 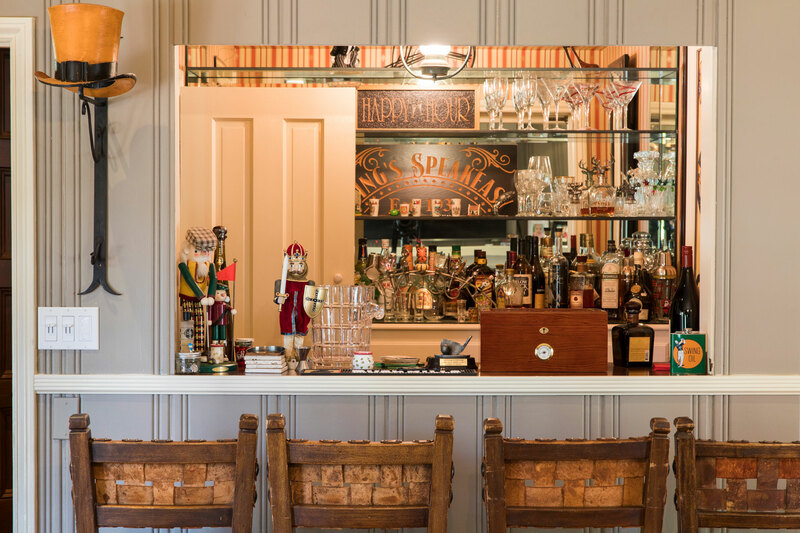 Because the house was built in the final year of Prohibition, the den contains a bar area that can be hidden behind a sliding panel in the wall. Photo by Daniel Deitch. HIDDEN GEM Crosby’s home on Forman was commemorated in postcards while he lived there, but today its story is overshadowed by that of the larger estate on Camarillo. POSTCARD FROM THE PAST When the home on Camarillo was built, an article in Arts & Decoration declared, “Peace, dignity and comfort are all to be found in the new home the Crosbys have built in the San Fernando Valley of Southern California. An American home of sound taste, Dixie and Bing Crosby have built for the rearing of four sons and for their own living!” Photo from the collection of Mary Mallory. 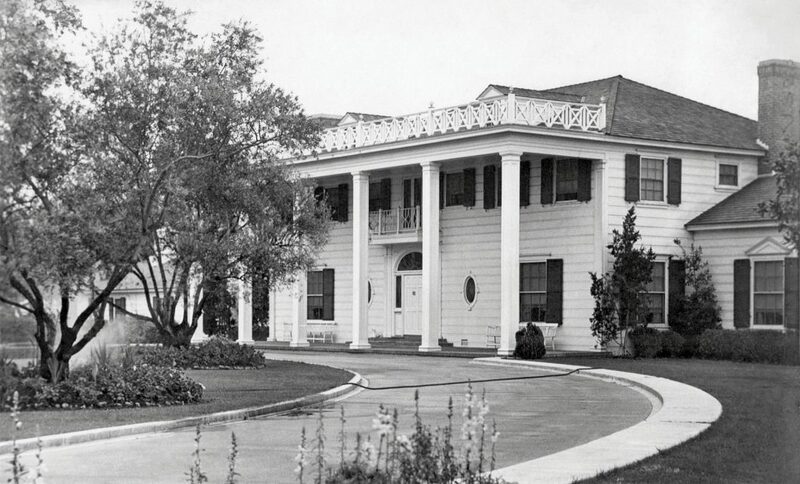 In 1936, the Crosbys built a southern-colonial-style home on Camarillo Street between Ledge and Cahuenga, plus a smaller colonial across the street for Bing’s parents. Designed by J. Robert Harris and decorated by interior designer Harold Grieve, the 20-room main house was grand but not formal. 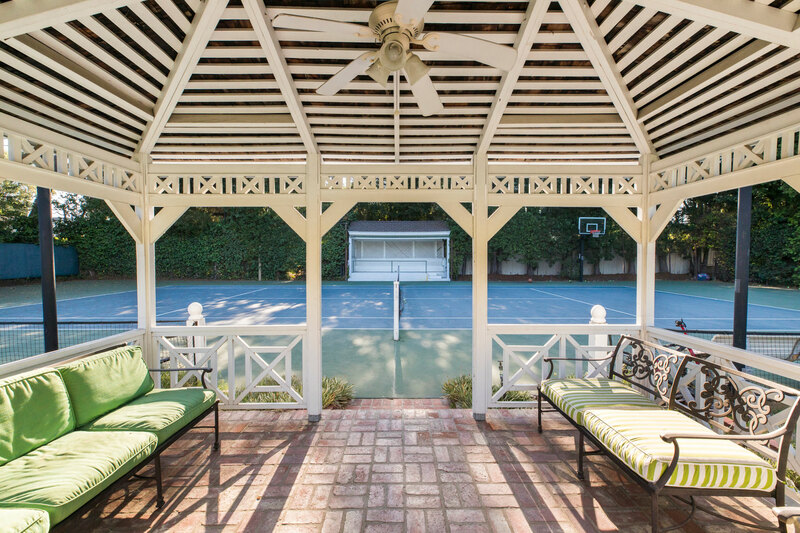 The 4-acre estate was ideal for an active family, with a large pool and a tennis court. By most accounts, the Crosbys were happy there, hosting star-studded parties and welcoming celebrity visitors. Bing’s career was booming, and in 1940, he starred in Road to Singapore with Hollywood newcomer Bob Hope, the first of the seven popular movies they would make together. 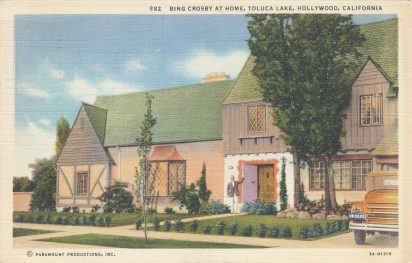 The Hopes stayed in the Crosbys’ guesthouse while their own Toluca Lake estate was being built, and both families were active members of St. Charles Borromeo Church in North Hollywood, with the Crosby boys attending the parish school. Most of the second story burned, and between the smoke and water, damage was estimated at $200,000 — not including the tremendous loss of valuables and priceless memorabilia, including a complete collection of Bing’s recordings and thousands of dollars’ worth of Dixie’s furs and jewelry. Materials to rebuild were scarce during World War II, so the Crosbys ended up selling the house and moving to Holmby Hills, where they lived for 20 years. 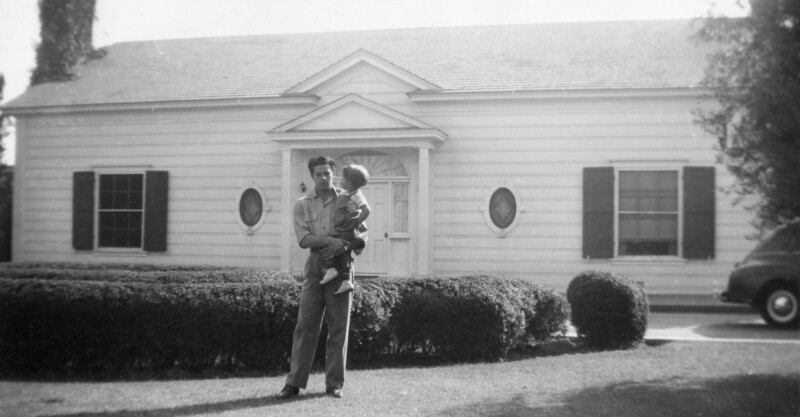 Micky Dolenz with his uncle Jack in front of the estate’s guest house. Bob and Dolores Hope stayed there during the Crosby era, and Dale Evans reportedly used it as her office for a while. Photo courtesy of Micky Dolenz. It’s unknown who bought and rebuilt the Crosby home (in a similar but modified colonial style), and the next few decades of its history are hazy — except for a year or two around 1947, when George Dolenz and Janelle Johnson took up residence with their toddler son, Micky. 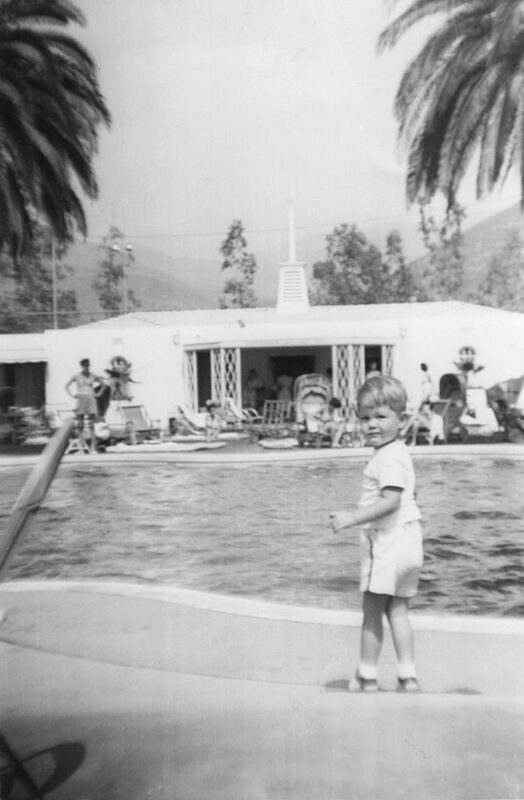 Micky Dolenz as a toddler, in front of the Crosby estate pool and cabana. Photo courtesy of Micky Dolenz. “My dad was an actor, and my mom was an actress, and they met doing a play and moved to a chicken ranch in Tarzana,” Micky Dolenz explains. “His day job was as the maître d’ at the Trocadero, a very famous restaurant and nightclub on Sunset Boulevard in Hollywood. And one night he ended up standing next to Howard Hughes in the men’s room.” They struck up a conversation, and upon hearing the maître d’ was also an actor, Hughes signed him to a lucrative contract with his studio. 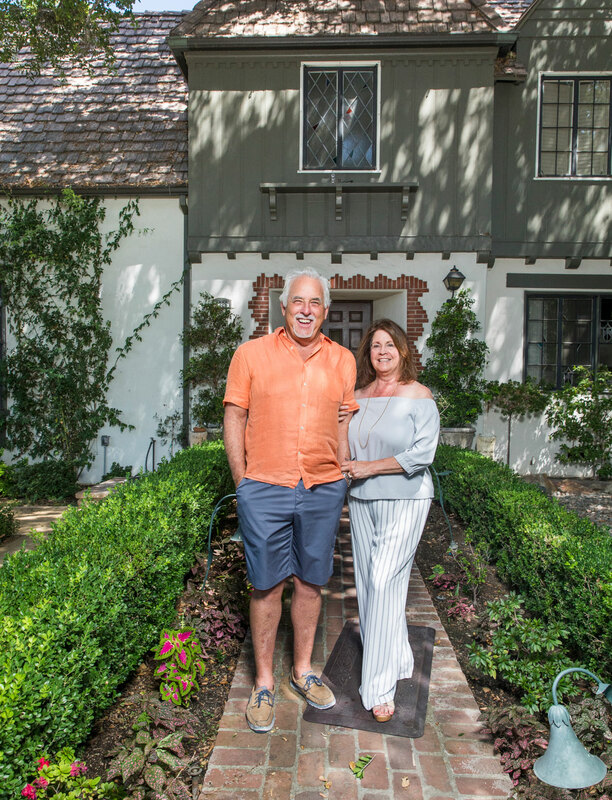 The steady income was enough for the Dolenzes to upgrade their home, and they purchased the Crosby house. 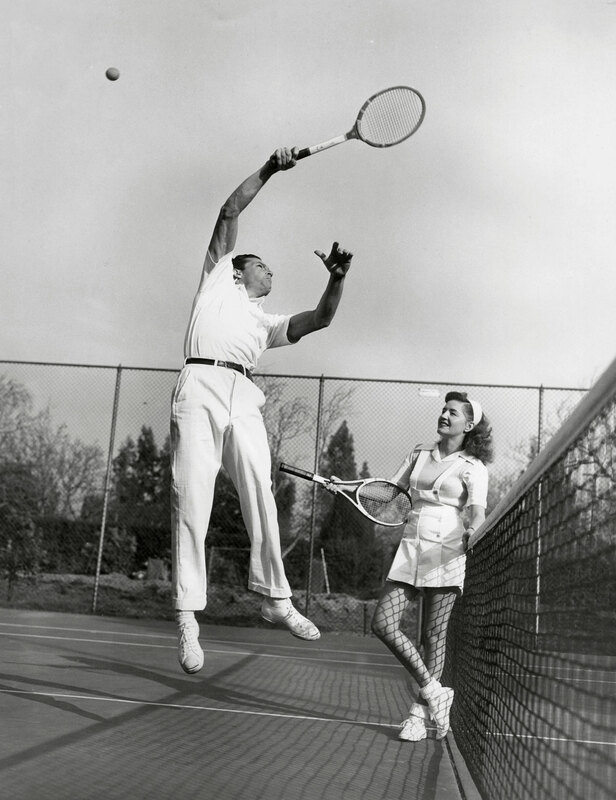 LOVE–LOVE Micky’s parents, actors George Dolenz and Janelle Johnson, on the estate’s tennis court. Crosby wasn’t known as a player himself, but he built the court, complete with viewing stand, to host celebrity tennis parties that attracted famous aces like Bill Tilden. Photo courtesy of Micky Dolenz. 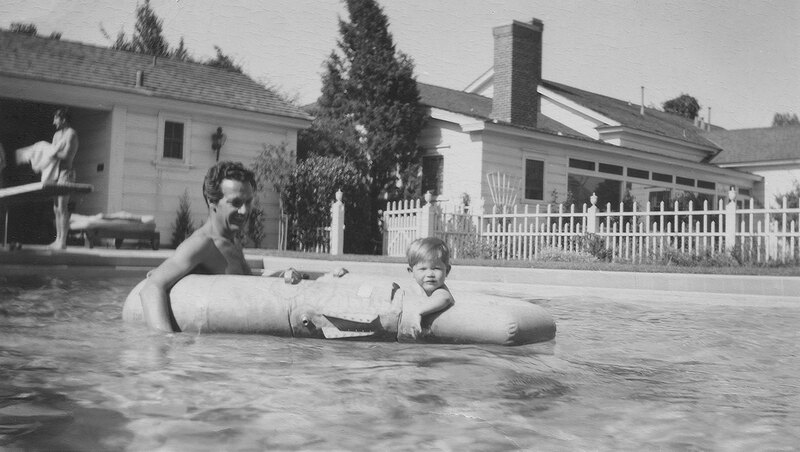 WATER BABY Young Micky Dolenz floating with his father in the Crosby estate’s pool, with the cabana at left and the main house visible behind them. Photo courtesy of Micky Dolenz. HEY, HEY Actor and musician Micky Dolenz was born and raised in the Valley, including a few years at the Crosby estate. When not on tour, with either the Monkees or his solo act, he creates custom pieces for his family’s woodworking business, Dolenz & Daughters. “All my life I’ve had a shop,” he explains. “I was going to be an architect, going to L.A. Trade Tech, when along came the Monkees audition.” Photo by Daniel Deitch. 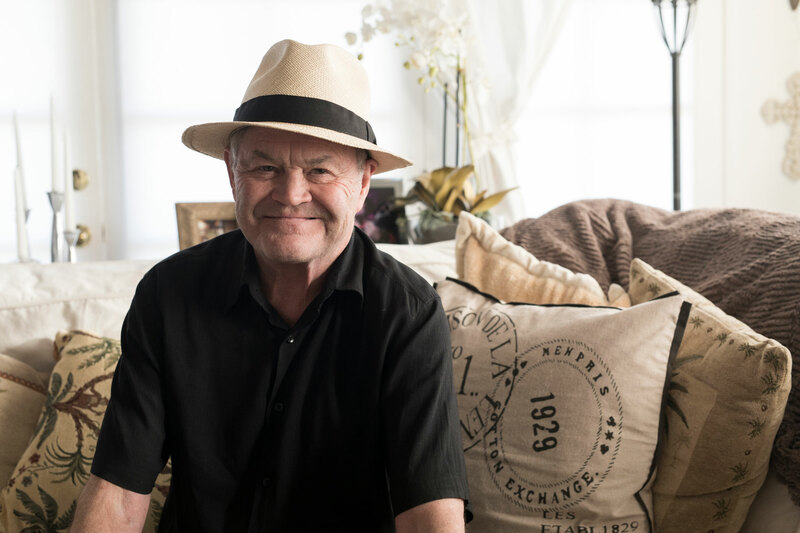 “I thought he was just messing around.” That was the reaction of Larry Stickney, who owned the Crosby house from 1997 to 2011, when he met Micky Dolenz at a party and heard he had once lived there. 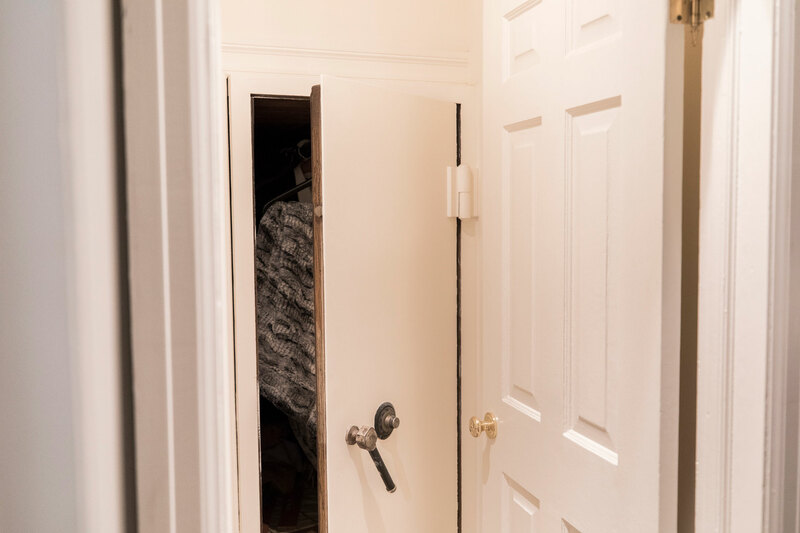 “Then he showed up with photos and I had to believe it.” The discovery filled in a gap for Larry and his wife, Kerry, who had devoted themselves to piecing together as much of the house’s history as they could. “I know that somewhere in the ’50s, the house was purchased by [Chinese political leader] Chiang Kai-shek’s daughter, but she was not used to living in a huge house alone and was very uncomfortable there, so she moved into the carriage house and sold off the main property,” Stickney says. HOME FOR THE HOLIDAYS “Christmases in the house were very special,” former owner Larry Stickney remembers, “because of Bing’s movies [Holiday Inn and White Christmas] and the song, and the fact that my wife just went gonzo over Christmas. It was very traditional; we’d seat 12 or 14 in the dining room and cook a big meal, and then the carolers would come by, down Camarillo.” Photo by Daniel Deitch. The Griffiths then sold to actor Jerry Van Dyke and his wife, Shirley. The most significant event during their residence was the 1994 Northridge earthquake, which broke all four masonry fireplaces and toppled a 7-foot-wide chimney through the roof. It ripped a 10-foot hole in the master bedroom ceiling and barely missed the sleeping couple. “They were saved by the chimney leaning against the four-poster bed,” Stickney explains. It took two or three years to rebuild the house; the Van Dykes made several design changes in the process, notably reducing the square footage of the second story, but the overall footprint remained essentially the same. The Stickneys collected Crosby memorabilia, including the original signed building permit, and delighted in historical discoveries such as the fire-singed remnants of a bathroom in the attic, vintage golf balls in the hedges and an old wooden rosary in the garage. “One of my favorite things about living there was coming across things of that era, uncovering the past,” Stickney says. After Kerry Stickney passed away in 2009, Larry put the house on the market. Tributes to the Crosbys are still proudly displayed in the home, including this check signed by Bing. Photo by Daniel Deitch. The foyer and grand staircase. Photo by Daniel Deitch. The cabana, looking out on the pool. Photo by Daniel Deitch. Bringing the story full circle, the Cedergrens have four children, like the Crosbys did. And, fortunately, the house has found another set of residents who see themselves as stewards of its past. Although they’ve made some renovations, mainly necessary repairs and updating the interior design, they’ve tried to stay true to what they feel is the spirit of the home. 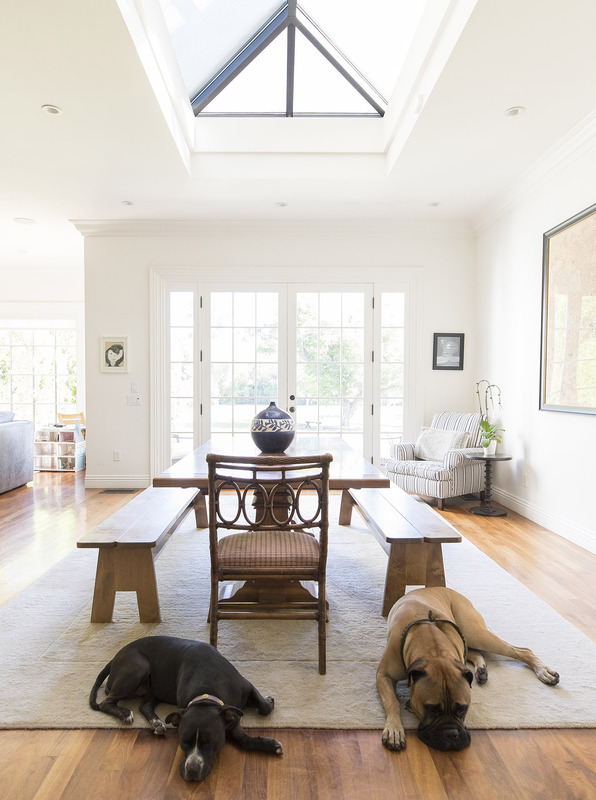 RESTFUL ROOM Pit bull Xena and bullmastiff Simba relaxing in the light, airy living area. Photo by Daniel Deitch. LUXURY LOCKUP Among the original architectural features is Dixie Crosby’s fur safe, an upstairs closet with a combination lock. While it secured the valuables against theft, it apparently wasn’t enough to prevent their destruction in the 1943 fire. Photo by Daniel Deitch. A gazebo built by later residents overlooks the original tennis court and viewing stand. Photo by Daniel Deitch.